During the period from about 1500 to about 1700, which is often called the “golden age of Venetian glass,” nearly all of the luxury glass used in Europe was provided by Venice. Gradually, the styles changed, at least in part to keep customers buying the latest designs. Along with the aesthetic changes came changes in techniques. 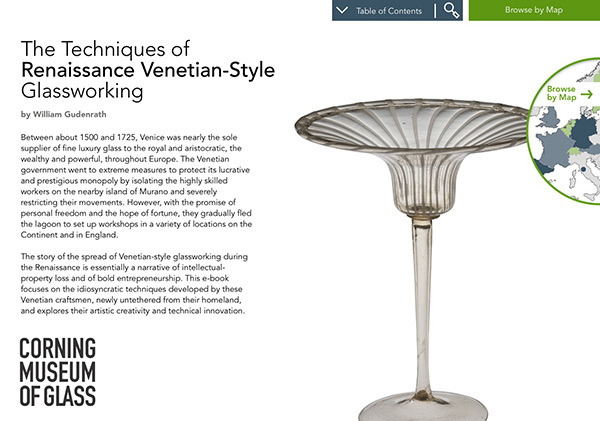 In addition, as we will see in part four of this preface (The Material: Making Glass in Renaissance Venice), glassmaking changed, offering a broader array of colored and specialty glasses. Objects from about 1500 are typically decorated with mezza-stampatura (also called mezza-forma, “half-molding” or “gadrooning”; variations are nipt-diamond-waies and broken ribbing). Representative objects are the Enameled Tazza, Enameled Goblet, and Ampollina; their videos illustrate this technique and its variations. These objects are not especially thinly blown. For example, the Enameled Goblet weighs 197 grams, while the Simple Flared Wineglass, which dates to perhaps a few decades later and is only seven millimeters shorter, weighs a mere 65 grams. Perhaps the thicker glass made the difficult process of firing the enamels somewhat more controllable. By this time, gilding and enameling seem to have fallen out of fashion. To take their place, the decorative technique of filigrana had been invented and was becoming established. Here, canes of colored glass were embedded (usually lengthwise) in colorless glass to decorate an object. The canes could be either twisted or left straight. This process was accomplished by two different methods. The first was to attach the canes to the outside of a relatively thick bubble of glass. Then, after reheating, the bubble was further inflated and shaped. The Footed Bowl with Filigrana was made by picking up canes lengthwise and simultaneously wrapping another set of canes around the bubble, as is illustrated in the video of that object. The second method involved fusing many canes together, then rolling them up on a glass “collar” attached to the end of a blowpipe. After reheating, the end of the cylindrical roll-up was closed, and the usual glassblowing processes were employed to create an object. For a complex, multipart vessel, such as a goblet, the tubular matrix of canes could be divided into segments and used for different parts of the object. The video of the Three-bubble Goblet with Filigrana illustrates this procedure. These two approaches usually resulted in differences in appearance. When canes, with their colored-glass centers, were attached to a bubble of glass, they were generally somewhat widely spaced and stood proud of (were raised above) the exterior surface. Other objects in the Corning Museum of Glass collection that were fashioned in this way include a covered goblet (79.3.363), a covered cup (2013.3.15), a goblet bowl (79.3.223), and a tazza (66.3.62). By contrast, canes rolled up on a collar were typically closely spaced, and the threads of colored glass were thoroughly embedded midway in the vessel wall. In this method, the vessel wall consisted entirely of canes. Confusingly, though, upon very close inspection, a thin layer of colorless glass can often be detected in objects made by this method. The thin layer is often cited as evidence that the canes were picked up on a bubble. For 16th- and 17th-century objects with closely spaced canes, however, this was probably never the case. Instead, the little-known sbruffo process was employed. Here, a relatively thin bubble of colorless glass was lowered into an open-ended roll-up of canes, quickly inflated, and cut free of the blowpipe. If the technique was carried out perfectly, the bubble completely filled the grooves between the canes. More often, long channels of narrow bubbles could be found between the sbruffo liner and the canes. In the video of the Reticello Platter, a sbruffo liner can be seen being made in order to thinly line the top surface of a reticello platter with colorless glass. In the video of the Three-bubble Goblet with Filigrana, the sbruffo process is used to line all of the parts of the object. Unlike gilding and enameling, which have fallen in and out of fashion in the long history of Venetian glass, filigrana has remained indispensable for Venetian glassworking from its inception, and filigrana works continue to be made today. Beginning sometime in the mid- to late 16th century, Venetian glassblowers developed the ability to blow glass of extreme thinness. Elegant goblets often displayed a sovereign mastery of both the material and the processes. When one handles such glasses, their near weightlessness never fails to impress. For example, the Simple Flared Wineglass, which is about 15.5 centimeters tall, weighs only 65 grams; that is about the weight of two dozen U.S. copper pennies. In glassblowing at the furnace, thinner means more difficult. The Renaissance maestros’ accomplishments in this regard have never been closely approached, much less exceeded. (The thinnest Venetian glass is significantly thinner than typical Roman glass.) Their technical mastery of the nearly minimalist designs probably paved the way for the complexities of the next century. The video of the Simple Flared Wineglass conveys the deceptive simplicity of the manufacturing process. Alongside elegant, undecorated goblets, there seems to have been an increasing taste for ornamentation in the 17th century. The use of morise (bit work) proliferated and gained complexity. In this process, immediately after a goblet, say, was completed, tiny gathers of glass (usually colorless and transparent aquamarine) were attached and manipulated with hand tools. A two-part decoration, often called “wings,” was widely employed during this period; it demanded great speed and sureness of hand. The technique was particularly difficult in two respects. First, wings are always seen in pairs, and they required a high degree of symmetry. Second, because they were the last step in the making of an object, any mistakes would cause the entire object to be lost. The Flared Wineglass with Wings and Wineglass with Flameworked Flowers are examples. While less complicated, the tiny handles on the Small Cup with Two Handles presented similar challenges to the glassblower. Most Venetian glassblowing of all periods has been executed by “free” blowing, employing only gravity, centrifugal force, and the simplest of hand tools to shape the glass. During the 17th century, there was an increasing use of molds to create both form and decoration. Full-size blowing molds could help to produce, nearly instantly, the final size and shape of a bubble of glass. For an example of this, see the Lion-mask Stem and its video. Dip molds, often called optic molds, were used to impart a visual “texture” to a small, thick-walled bubble that was always further inflated and shaped. The stems of the Goblet with Aqua Stem and the Tazza were so treated, as was the bowl of the Wineglass with Kuttrolf Stem. Fin molds were employed to make unrounded, geometric rims, as, for example, in the Aspersorium. The most elaborate of the molds was the edge-crimping mold, which is seen in the video of the Quatrefoil Goblet. The major technical development in late 17th- and early 18th-century Venetian glass was the practice of prefabricating a number of parts for an object, then joining them (while they were still very hot) with tiny gathers of molten glass, which are often referred to as glue bits. This resulted in finished objects of much greater complexity. The Dragon-stem Goblet clearly shows glue bits atop the dragon’s head and the base, which were used to attach the cup and foot respectively. The video of this object presents the process. Additional examples are the Goblet with Inner Blue Ball, in which the internal aquamarine ornament adheres to the interior of the bowl, and the Ampollina and the Wineglass with Flameworked Flowers, in which the prefabricated flameworked flowers are attached to the vessels with tiny glue bits. The handle and bowl of the Spoon are similarly joined. Perhaps the most spectacular technical achievements of the later “golden-age” objects are displayed in the lidded goblets in Rosenborg Castle in Copenhagen, Denmark. These goblets, which were given to King Frederick IV during his 1708/1709 visit to Venice, were shipped to Copenhagen and placed in the castle’s “glass room” shortly thereafter. Consisting of many prefabricated parts that were joined with glue bits while they were hot, these vessels are among the crowning achievements of Venetian glass of any period. In size (up to one meter tall) and complexity (as many as 25 parts), some examples are without parallel (Fig. 30). Still life with crystal goblet, fruit, violin, and parrot. Gabriele Salci (active in the early 18th century), 1710–1720. Palais Liechtenstein, Vaduz. Photo: LIECHTENSTEIN. The Princely Collections, Vaduz-Vienna.